One of the users of StackExchange asked a question, which at first glance may look weird: why is the mouse cursor slightly tilted and not straight? Indeed, why the cursor is not vertical? The answer was given by an expert, who is familiar with the history of computer hardware. He confirms, that initially the mouse and therefore the mouse cursor invented by Douglas Engelbart, was an arrow pointing up. However, graphical interface for the first operating system in the world was designed by Xerox, precisely — the Palo Alto Research Center. 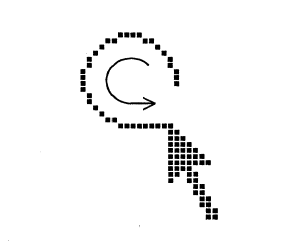 The mouse cursor was described in a document, which lists all of the specifications of XEROX PARC, the first computer with graphical user interface. It was found that, given the low resolution of the screens in those days, drawing a straight line (left edge of arrow) and a line at a 45 degree angle (right edge of arrow) was easier to do and more recognizable than the straight cursor. These days, the tradition is being kept alive despite high-resolution displays we have and huge technological progress in general. But how people came with this idea, i cannot grasp. Maybe they just rotating cursor around 360 degrees and get a simple solution?